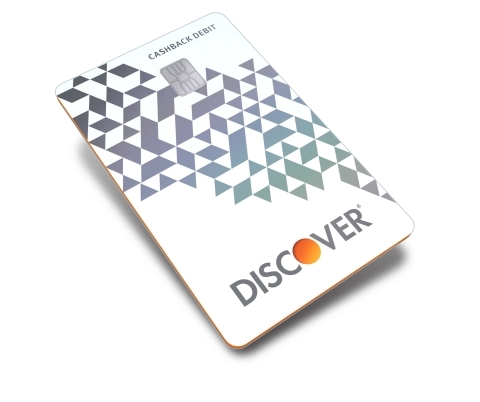 RIVERWOODS, Ill.--(BUSINESS WIRE)-- Discover is introducing more features and debuting a new debit card design for the Discover Cashback Debit product. Customers of Discover Cashback Debit, previously known as Discover Cashback Checking, will now be able to temporarily freeze their debit card, automatically transfer their earned cash back to their eligible savings account and pay using a stylish new card. First Fee Forgiveness4 which automatically waives the first eligible fee when it occurs each calendar year, with no action required by the customer. No-fee access to over 60,000 Allpoint® and MoneyPass® ATMs in the U.S. Discover Cashback Debit accounts are FDIC-insured to the maximum allowed by law and all new debit cards are enabled with chip technology, providing additional security at store terminals and ATMs. 1When you freeze your debit card, Discover will not authorize new purchases, or ATM transactions with that frozen debit card. Most other account activity will continue as normal, including previously scheduled and recurring transactions, internal and external transfers, deposits, online bill payments from the Discover Account Center, returns, credits, dispute adjustments, reward redemptions, and checks paid. 2 You must enroll to obtain Discover’s Auto Redemption of Cashback Bonus to Savings. You must designate one eligible Discover savings account into which Discover will automatically deposit any earned Cashback Bonus on a monthly basis, and such deposit is not reversible. 3 ATM transactions, the purchase of money orders or other cash equivalents, cash over portions of point-of-sale transactions, Peer-to-Peer (P2P) payments, and loan payments or account funding made with your debit card are not eligible for cash back rewards. In addition, purchases made using third-party payment accounts (services such as Venmo® and PayPal™, who also provide P2P payments) may not be eligible for cash back rewards. 4In each calendar year (January 1 through December 31), the first eligible fee charged to your Cashback Debit Account will be automatically waived and credited to your account. Insufficient Funds and Stop Payment fees are eligible for the first fee forgiveness program. Wire transfer fees are not eligible, and will not be waived even if they are the first fee on an account in a calendar year.